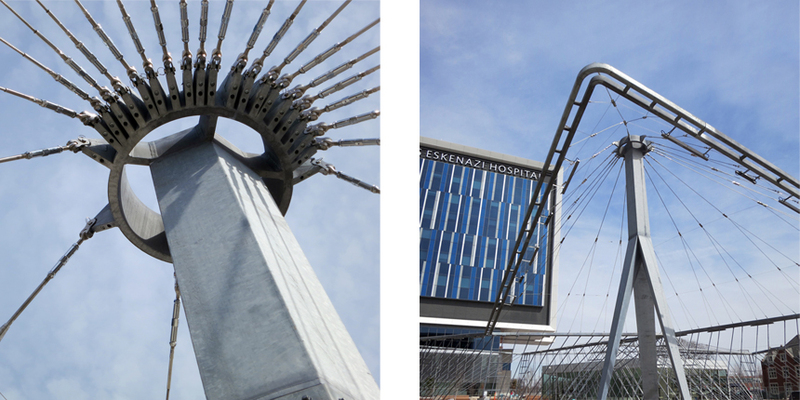 At only 13,000 square feet, the Commongound community green space at Wishard Hospital in Indianapolis, Indiana presented large-scale structural challenges. The trellis structure, designed to support native vines, is built with only 1.25-inch steel rods (plants won’t attach to wider rods). To ensure stability of the structure and achieve a fractal-like cable pattern, we used a form-finding “precalculation” of cable geometry to speed up finite element modeling– potentially saving weeks in calculation time. Vierendeel trusses in the corners add lateral stability.